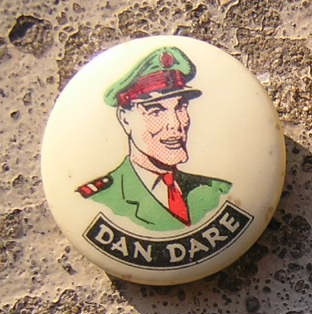 Hey, have you got Dan Dare's cap badge? Alas, no, sigh... yet another aspirational challenge failed... this one long ago from the small ads in boys magazines in the 1950s along with other, pointed advice about beach physiques and stamp collecting. Dan's 'authentic' cap badge in brilliant red, black and yellow, that is, with its steel torpedo shaped spaceship at the centre? Surely everyone would want such a badge - but there was a catch. You had to be a member of the Horlicks Spacemen's Club to get one. Not an insurmountable obstacle to be sure, but money was involved. Dan, or to give him his full title, Colonel Daniel McGregor Dare, was a very British hero, with very British values, such as all parents might hope their boys would aspire to. Throughout the 1950s he rocketed around the Solar System pulling off incredible feats of piloting skills and facing up to the most awful predicaments with a stiff jaw and those famous way eyebrows. Curiously, his spaceship, Anastasia, was named after his Aunt. The Eagle folded long ago (in 1969) but Dan still jets around from time to time. As well as several new comic incarnations, there have been more radio serialisations, and some musical appreciations too. Pink Floyd founder Syd Barrett wrote Dan Dare into his song 'Astronomy Domine', from the band's debut album The Piper at the Gates of Dawn, with the line 'Stairway scare, Dan Dare, who's there?' Elton John recorded 'Dan Dare (Pilot Of The Future)' for his 1975 album Rock Of The Westies and the British punk rock group The Mekons included a song 'Dan Dare' on their album The Quality of Mercy is not Strnen (sic). As to the badges, well, its not too late, you can buy brand new ones plated in 24 carat gold for the surprisingly modest price of about £10. But the 'authentic' badge, was not made of metal, but of plastic.That's the space age! 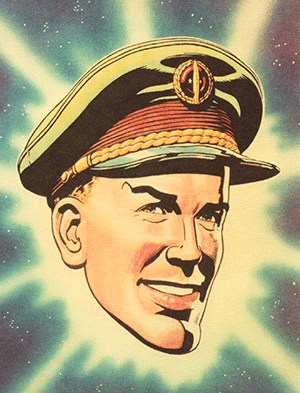 Colonel Dan Dare was originally 'Chaplain' Dan Dare of Space Fleet, with rather dull pastoral duties. Only at the very last minute did he swap hats to become the dashing space pilot that boys and girls might really aspire to follow. I listen to children's stories on the radio with great interest, as to what the "serious side" really is. Sometimes I hope it isn't what I think! What was it - and what do you hope it is not?! Would you gentleman think it is important for children to have some kind of fiction hero in their childhood to inspire or look up to? Plato said it was important - and that the heros must be clean-living folks! He complained about all the awful things that went on in the theatre. For myself, I think literature should refelct the highest values - and not even just for children! Not only in childhood Tessa. I think that there are people we look to all the time, in my case Martin and yourself not excluded. At the same time, I think there is a danger in what we look to or up to. Is it merely a construct, which really does not exist? On Martin's earlier question, I haven't listened to children's stories to remember them. I heard one children's story, apparently innocent, which I hoped was not conveying ethnic elitism. Every story has a meaning, even if it is about ducks or fairies. I do assure Thomas that I exist! At least, I do whilst I assert the fact - vide Descartes. I agree that a healthy human trait is to 'look to others' all the time, not exaclty passively, but empathetically. All of which does connect to this concern with computers - a topic I (am I repeating myself?! sorry if so) I researched long ago... I do beleive that computers in ALL their forms are a danger to both young and mature minds. The reason is that they change the way we intereact. Just look at the mindless agressio of comments people post under news stories. (Not here, touch wood!) The machine is like a servant that anyone can order to do things - and the machine usually obeys. When it doesn't fury is often the response. That's unhealthy in itself. Similarly, the realtino ship fo human to human is replaced by that mediated by the machine - the interenet as now - and it is an easy step to make the machine primary and the world secondary. In other words, going back to our central issue, isn't the problem not just the message - but the medium too?